YOU ARE A KEY TO THE KINGDOM! Nearly 2000 years ago, the Apostle Paul wrote those words to some special people. That verse is so appropriate even today, as I think about…you! Paul was filled with joy and he commended those believers. When he was in need, and no-one else contributed to his ministry, the Philippians were there. They “got it”. They were deeply connected with God and Paul’s abundantly fruitful ministry. And wow, what a harvest they reaped! Over the past 32 years we have rarely made an appeal for finances. Please know that behind the scenes we are grateful for your financial partnership. You are just like the Philippians. You see the consistent fruit that Kingdom Bound Ministries bears and are our partners in the gospel. 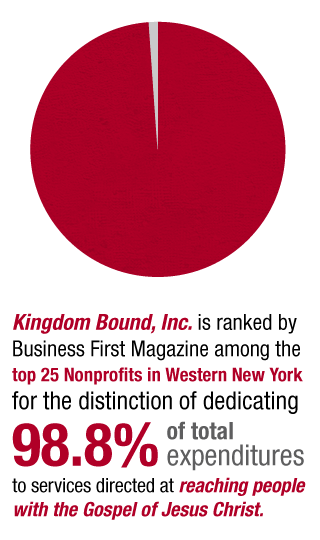 As we prepare for the 32nd Annual Kingdom Bound Summer Festival, we want to thank you for your continued support. We are so grateful for your participation in both the Kingdom Bound Festival and our year round ministry. All who give, attend, volunteer, speak and perform are part of a wonderful family that is impacting the world for Jesus Christ! Consider that the Lord may call you to not only pray, but to give. Ticket sales for the festival help cover those basic operating expenses and very little else. As costs continually rise, we are challenged to keep Kingdom Bound events affordable. Your continued support also enables us to pursue opportunities for ministry that are presented to Kingdom Bound every year. Kingdom Bound Ministries, PO Box 1622, Williamsville, NY 14231-1622. We thank you in advance for prayerfully considering your involvement and giving. God bless you and your family. We are praying for you! YES! I’m excited to partner with Kingdom Bound Ministries!